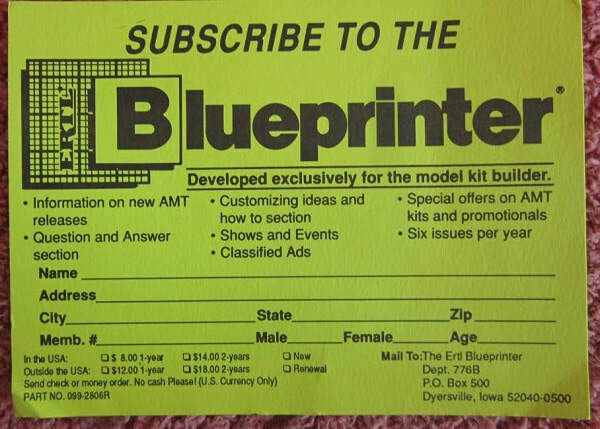 I bought my kit back in the 90's at the Ertl factory discount store in Dyresville, IA, that is 56 miles from my home. Ertl went out of business. I bought my kit for $5.00 when I saw it marked down from $17.95 because all the boxes were badly crushed due to the shrink-wrapping machine using too much pressure. 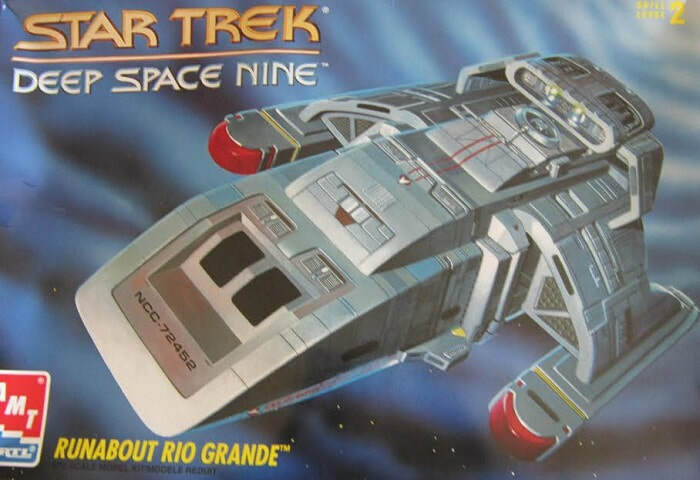 The box art shows the Rio Grande runabout spaceship posed against an all blue background. It has various panels done in shades of gray and black. The noses on the engines are bright red. 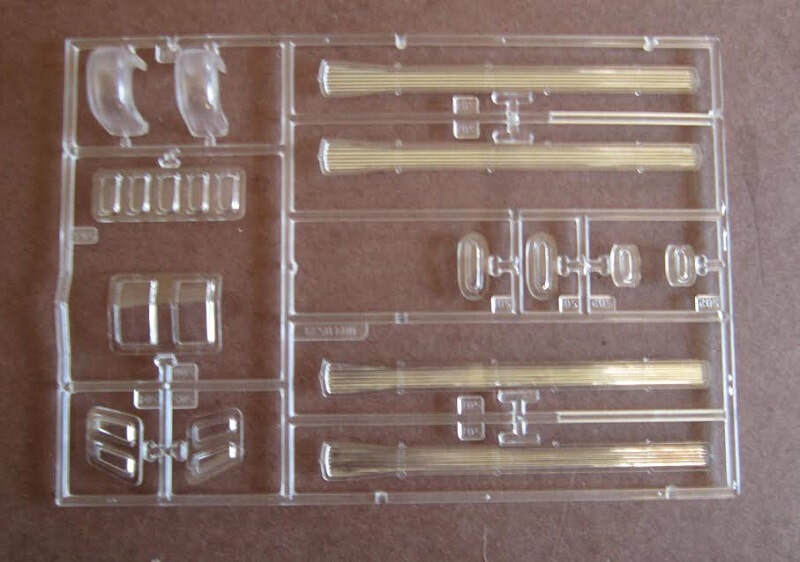 One side panel lists features of the kit: highly detailed plastic model kit, 1/72nd scale measures over 12" long when model is fully assembled. (I don't know how they came up with this scale, because this model is fictional). 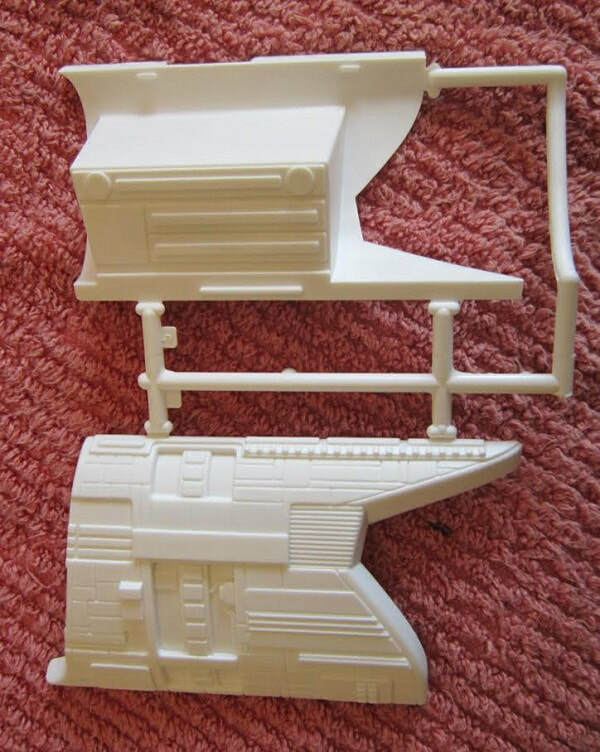 ​kit features detachable Deep Space sensory array, decals are included for 3 different runabouts. This is followed by a side view illustration that points out various areas: sensor cluster (attaches for mission-specific tasks), warp drive reactor, view ports (port side shown), warp engine nacelle, bussard ram scoop and mission-specific cargo module. 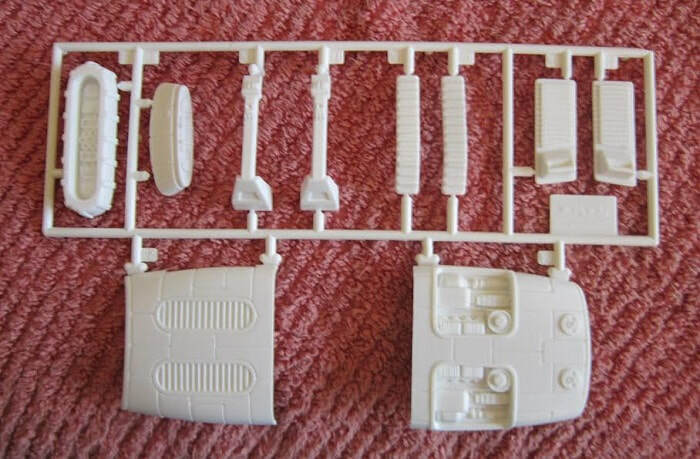 Skill level is a 2, kit contains 44 parts and Ertl's phone number is provided. The other side panel gives more features in English, Swedish, French, Danish, Italian, Spanish, Portuguese, German, Dutch and Greek. 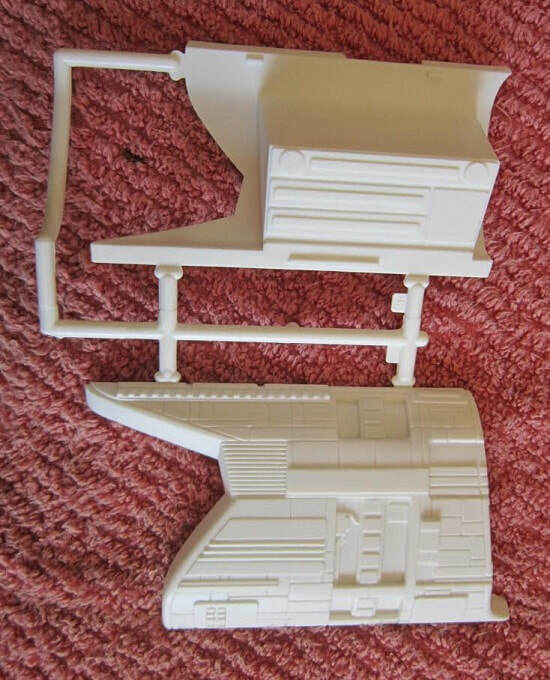 Paint and cement are not included, followed by AUTHORIZED BY PARAMOUNT PICTURES and Ertl's address in Dyresville, IA and MADE IN USA. The kit contains 8 chalk-white parts trees in a sealed clear cello bag and 2 loose chalk-white hull parts that are held together with a rubber band, a clear tree in another clear cello bag, the instructions and the decal sheet along with a Blueprinter subscription form. ​The cello bags have warnings printed on them of the danger of suffication to children of them. The instructions consist of a single sheet that accordion-folds out into 6 pages in large 7 1/2" x 17 1/2" page format. 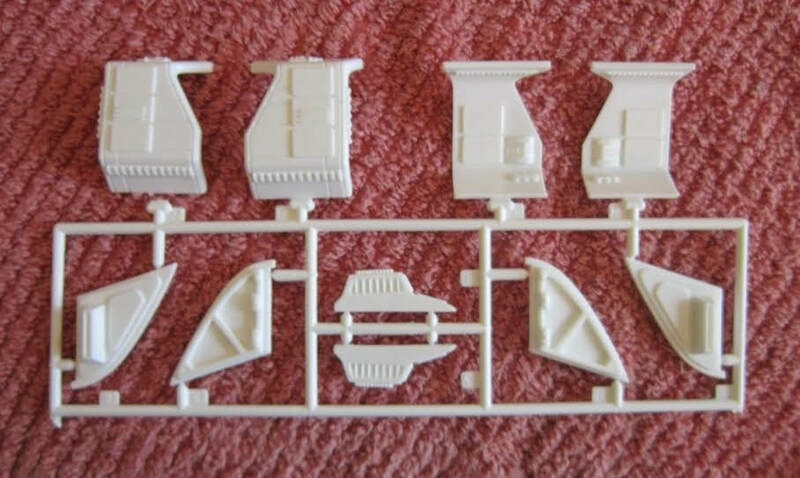 Page 1 begins with a black and white repeat of the box art, over the history of the Rio Grande Runabout and general instructions, with Ertl's phone number to use to call them with any problems encountered with this kit. Page 2 to 4 has 6 exploded drawings for assembly purposes. Page 5 & 6 has exploded drawing number 7 for painting and marking instructions, It has a 7-view on it. Colors are called out in FS numbers. 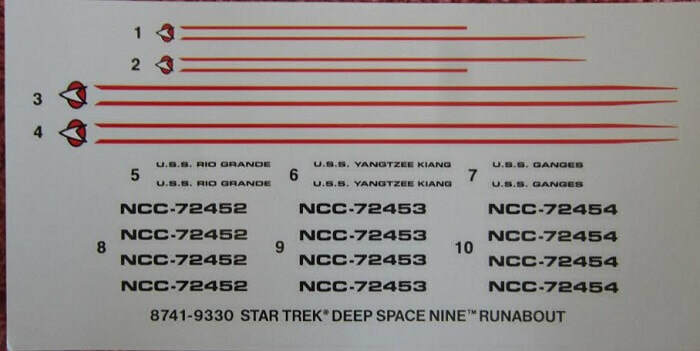 The decal sheet has red pin stripes on it and names and serial numbers to make the Runabout as U.S.S. Rio Grande, U.S.S. Yangtze or U.S.S. Ganges. 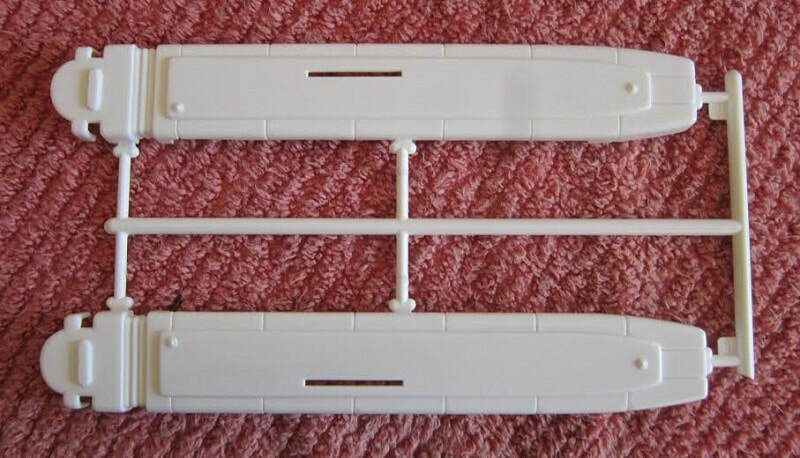 Trees are not alphabetized or illustrated in the instructions, but do have part number tabs next to the parts on them. 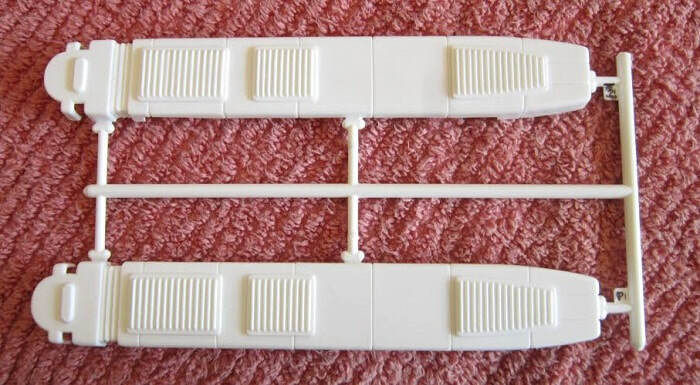 ​Then there is the loose chalk-white hull top and bottom parts. ​The clear tree holds the windows and the noses of the engines. Nice external detail. There is no internal detail or crew figures included.